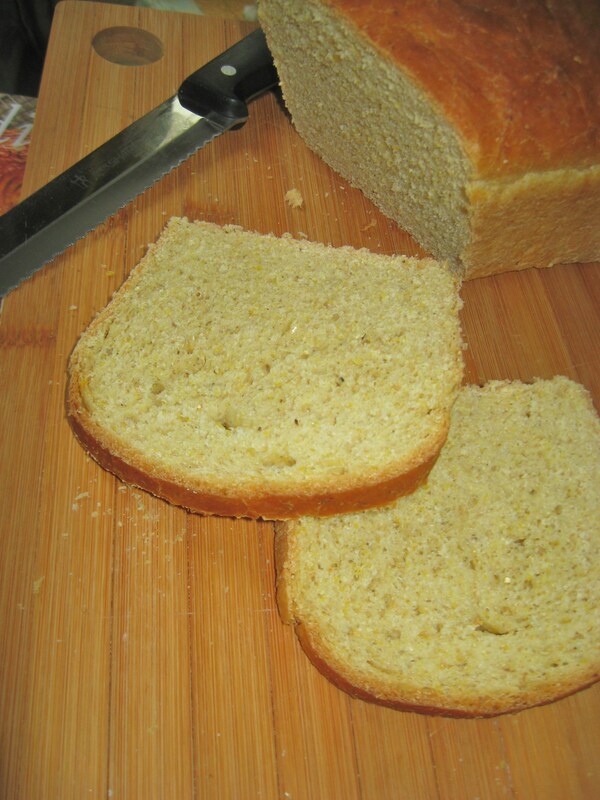 A hearty, not sweet yeast bread that’s great for sandwiches or simply toasted with butter. You don’t necessarily need to go for the finest cornmeal grind here. The dough is a bit sticky, but resist the urge to add more than the measure of flour noted to avoid a heavy loaf. 3 1/2-4 cups flour, siftedPlace cornmeal, butter and salt in large bowl. Add boiling water and stir until butter is melted. Set aside to cool until just warm. Dissolve yeast in 1/4 cup lukewarm water. Stir into cornmeal mixture and blend well. Stir in 1/2 cup milk or water and add flour, 1 cup at a time, blending well to form a dough. Turn dough onto lightly floured board and knead for 5-10 minutes, adding flour as necessary to keep flour from sticking. Place dough in oiled bowl, cover with damp cloth, and let rise in a warm place for about an hour, until it has doubled in size. Punch down dough and knead it for about 5 minutes. Return to bowl and allow to rise until doubled again. Knead for 1-2 minutes more. Place the dough in a buttered 9×13-inch or a 3-inch deep, 9-inch round baking pan and cover. Let rise about 40 minutes or until doubled in size. Bake 45-50 minutes at 350 degrees , or until bread pulls away slightly from the edges of the pan. Cool the bread in the pan.